Last week I went pottery painting at The Crockery again. It was a ‘girlie night’ with some of the ladies from work. 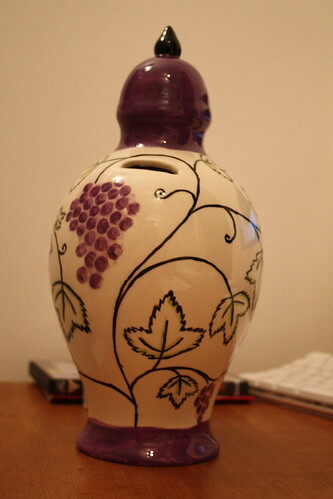 I decided to paint a terramundi – a money pot which you get to smash when full. I had thought that our existing one was much fuller than it actually is and that we’d be needing a new one soon – but in truth it isn’t even half full. I guess this is good, because it will be longer until I start filling the new one, and hence a longer time before I have to smash the one I’ve just painted. The Crockery, a store which used to be located in Southampton, is now 5 minutes walk away in Eastleigh. They provide pre-made, white clay bowls, plates, etc. and the glazes for you to use to decorate them. You sit in the store and paint the pottery and then leave it with them to be fired. In five days you have your own personalised pottery. I went to the store on Thursday to pass some time painting. Almost everyone else who came into the store when I was there was a new mum wanting to put her baby’s hand/foot on a plate/mug. I don’t have a baby, so I had to make do with creating something for my surrogate babies – the cats. I painted two bowls to be used for cat food bowls. 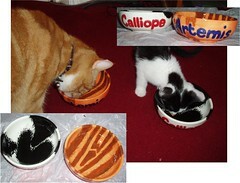 They’re supposed to look like the cats’ markings: a ginger bowl for Artemis and a black and white bowl for Calliope.